The Osage Nation is proud to announce completion of an exciting new project developing classroom lessons and educational resources about Osage history and culture - past and present. 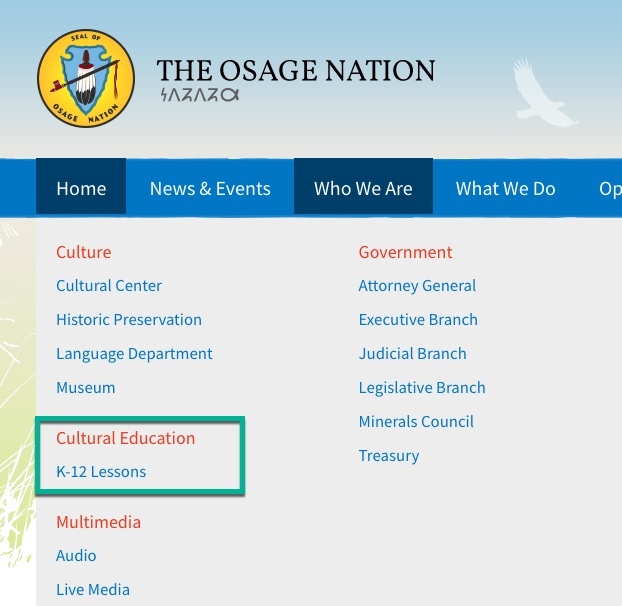 The extensive resources are now available to all and easy-to-find on the Osage Nation website: click at top on "Who We Are" and then underneath on the new section at left called: "Cultural Education - K-12 Lessons" (https://www.osagenation-nsn.gov/k-12-lessons). This project was an offshoot of the 2016 Flint Hills Map & Education Program that placed museum quality maps of the Osage/Flint Hills in 17 Osage County schools. Debra Atterberry, who helped coordinate the project, assisted with placements and asked Coordinator Annie Wilson to include Osage Nation culture in the program’s online K-12 place-based lessons, “so Osage youth can learn more about our rich culture.” Wilson agreed and suggested the lessons reside on the Osage Nation website, with links on the Map Program’s website. These practical, classroom-ready teaching materials and information resources (fact sheets, maps, booklets, etc.) will serve Osage Nation students, as well as kindergarten - grade 12 students across America - including the Flint Hills Discovery Center’s network of 183 schools in Kansas and Oklahoma, and all interested adults. Half of the lessons are historical, and half are about Osage Nation today. “We have a very unique and rich history to share, but it is also important to learn about the things we are currently doing and what we will be doing in the future,” states Debra Atterberry, a former classroom teacher and now a Strategic Planning analyst in the Nation’s Office of Self-Governance and Strategic Planning. Students will learn about a wide array of topics in two areas of focus. The “Osage People - in the Past” lessons include ancestral lands, early homes and villages, foods and agriculture, French fur trade, boarding schools, and the Reign of Terror. The “Osage Nation - Today” lessons, students will learn about Osage language, art and artists, Osage Ballet, heritage sites, Inlonshka, current lands, and communications. Special lessons on books about Osage life for young readers are also included. Co-Chairperson Mary Wildcat was immediately enthusiastic about the project knowing the development of culture-based lessons is a goal for many Native nations. To the Committee’s knowledge, the only other tribal-specific program similar to this in the United States is at the Chickasaw Nation; they have 26 lessons on the history of the Chickasaws. The Osage Classroom Lessons Committee includes Osage Nation members Debra Atterberry, Mary Wildcat, Dr. Andrea Hunter, Sarah O’Donnell, Addie Hudgins, Norman Akers, Jann Hayman, Alex Red Corn, David Webb, and Michelle Harding; and Annie Wilson and Emily Hunter Connell of the Flint Hills Map & Education Program, a project of the Flint Hills Discovery Center of Manhattan, KS. The committee wishes to especially thank Chief Geoffrey Standing Bear, Paul Tutty, Hallie Winter, Matthew Thomas, Jami Powell, Candy Thomas, Randy Tinker Smith, Alaina Maker, Vann Bighorse, Eddy Red Eagle, Jason George, Mindy Standley, the Missouri Culture Trunk Project, and many others who have assisted the project.